It’s that time again, Playoff Hockey! 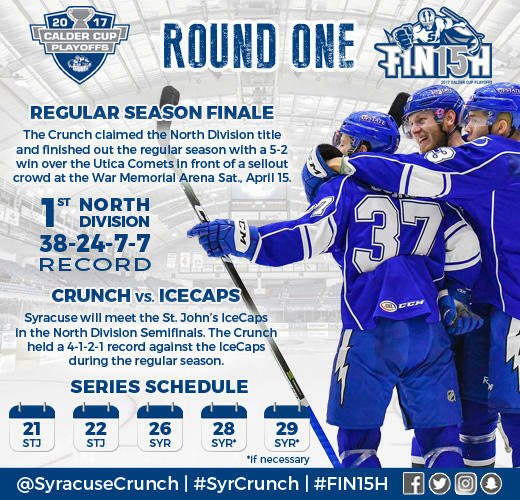 The Syracuse Crunch are preparing to make a run for the championship as they begin the playoffs against the St. John’s IceCaps with a road game today, Friday, April 21. In case you missed out on their 2016-17 regular season, we’ve compiled a list of 15 Things You Need to Know about this year’s team as they head into the first round of playoffs. Once equipped with our list of facts, we hope to see YOU cheering on the Crunch when they return home for Game 3! 1. Top of the Class: The Syracuse Crunch clinched first place in the North Division of the American Hockey League, after winning its last four straight games, and closing the regular season with a 38-24-7-7 record (wins-losses-overtime losses-shootout losses). 2. Just the Facts: The Syracuse Crunch were founded in 1994 by owner Howard Dolgon. An affiliate of the NHL’s Tampa Bay Lightning, the Crunch play their home games at the Onondaga County War Memorial (800 S. State, Syracuse). They are led by team captain Erik Condra and of course team mascot Crunchman. 3. Who, When, Where: The Crunch will play the St. John’s IceCaps in the first round of the 2017 Calder Cup Playoffs, with the first game of the best-of-five beginning in St. John’s on April 21st. 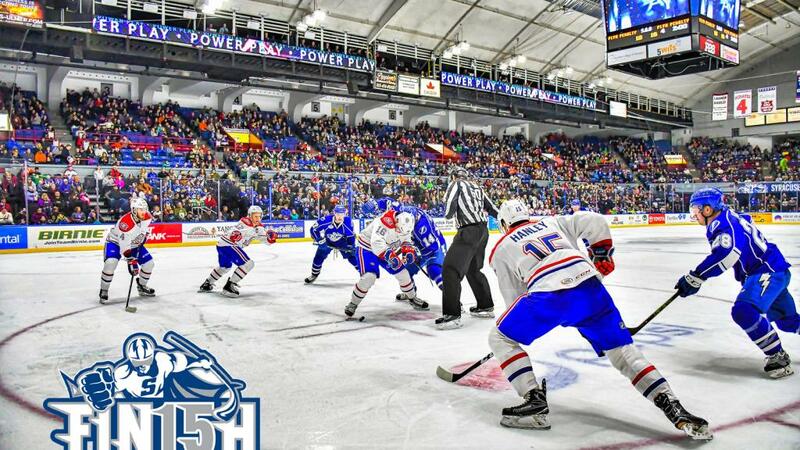 The Crunch will host their first HOME playoff game on Wednesday, April 26th for the third meeting of the series. The game is slotted for a 7 p.m. start time. 4. Crunch vs….Backstreet Boys? : Throughout the 2016-17 season the Syracuse Crunch players had some fun creating a series of Lip Sync videos. Our favorite of the series? The most recent, “I Want it That Way” by the Backstreet Boys, although defenseman Daniel Walcott’s performance in “Single Ladies” definitely rivals Beyonce. For the full video series check out their Youtube page by clicking here. 5. 1,765: The amount of miles the Crunch will have to travel to get to their first game in St. John’s, Newfoundland. As the top seed, Syracuse had the option to host the first two or (potential) final three but choose to begin on the road due to the distance required in traveling to St. John’s. 6. The Match-up: Syracuse is 4-1-2-1 against St. John’s this season, splitting its final two games against the Icecaps with a 4-2 win followed by a 2-3 overtime loss, back in March. The Crunch’s largest victory over St. John’s was a 6-2 win in November, while three of the losses came in overtime. 7. Winner, Winner, Chicken Dinner: The last time the Crunch led their Division into the playoffs, during the 2012-13 season, they reached the Calder Cup Finals, eventually falling to Grand Rapids. 8. Oh, Canada: The Crunch is 7-3-3-3 against Canadian teams this season, but 4-0-2-2 when playing at home. 9. We Missed You: Tampa Bay Lightning, the Crunch’s NHL affiliate, returned a total a seven players to the Syracuse line-up for the playoffs. Cory Conacher, who is tied for the team in points with 60 was sent back to the Crunch along with goal leader (22), Yanni Gourde. 10. Award Winner: Syracuse’s Matt Taormina was awarded the Eddie Shore Award as the AHL’s outstanding defenseman for the 2016-17 season. Taormina is tied for the league lead in scoring among defensemen and is tied for first among the Crunch in points with 60. 11. The Cup: The trophy itself is named for former NHL President Frank Calder. Although it was first awarded to Providence in 1938 it was actually the now defunct Syracuse Stars that won the first International-American Hockey League championship following the 1936-37 season. The trophy however, was never received by the team and was instead presented to a former player at a 1996 ceremony at the War Memorial. 12. Around the World: Seven different countries were represented on the Crunch roster throughout the season. Current international players include goalie Kristers Gudlevskis (Latvia), Henri Ikonen (Finland) and Matthew Peca (Canada), just to name a few. While there aren’t any true local players on this year’s team, defenseman Dylan Blujus hails from nearby Buffalo, NY. 13. FIN15H It: The Crunch’s slogan for the 2017 Calder Cup is FIN15H. The 15 in the word “finish” represents the 15 victories needed throughout the playoffs to win the Cup. Will YOU be there for all 15? 14. More than Hockey: Crunch players created the Change for Change program during the 2014-15 season to raise money for Upstate Golisano Children’s Hospital and pediatric cancer research. Players painted hockey-themed artwork at Painting with a Twist Dewitt to auction, created ornaments to see during the holiday season, wore specialty warmup jerseys to auction and participated in other activities throughout 2016-17 to raise money. *Unsubstantiated fact, but we bet they were close! The Crunch return home to the War Memorial for Game 3 on Wednesday, April 26th. They will play Games 4 and 5, if necessary, on Friday, April 28th and Saturday, April 29th.